The Fifth Joyous Mystery contemplates the time when, as a child, Christ lingered in Jerusalem after his parents had departed for home. The Gospel text relates that they were traveling with a party so large they assumed he was some place out of sight and didn't discover he was gone until three days into their homeward journey. When they got back to Jerusalem they found him teaching in the Temple and he said "Didn't you know I would be about my father's business?" ("Wist ye not" it says in the Authorized Version.) This event in the childhood of Christ is not commemorated liturgically at all in the West. It only comes up here in the Rosary. There is, however, a feast in the East called "Midpentecost". It is celebrated at the half-way point between Pascha and Pentecost, the 4th Wednesday after Pascha. It has no real scriptural warrant: the Gospel used is of Christ crying out "in the middle of the feast" which, of course, would be only the one-week long feast of Passover. But the icon used is "Christ Among the Doctors" which is of the youth Christ - in other words, it's an icon of the Mystery of the Finding of Christ in the Temple. The liturgical hymns for this feast - such as I've used below - are taken from various events in the scriptures as you will see from the texts I used below. The feast itself is made up: a conflation of events to make a point. That's not a bad thing; the West does it as well with feasts for the Motherhood of Mary, the Holy Eucharist, and even Trinity Sunday. The feasts of the Church's Calendar are not all tied to an historical event that happened on that specific day. The entire Calendar is a teaching tool, and icon, if you will. The Truth of Christ revealed in the Calendar is the reason for the Calendar. Hail, Mary, full of grace, the Lord is with thee; Blessed art thou amongst women, and blessed is the fruit of thy womb, Jesus, teaching the Elders in the Temple. Holy Mary, Mother of God, pray for us sinners, now and at the hour of our death. Amen. The Latin Phrase which was employed as the title of this article is translated as "Custody of the Eyes". It's a quaint, perhaps Victorian-sounding, phrase to which I was introduced by a Priest in NYC who had once been an Benedictine at the Great House of Nashdom in the UK. 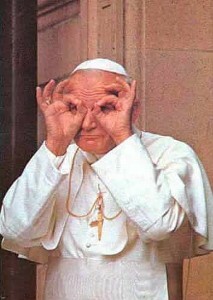 He noticed me, please forgive me, of a Sunday after Mass, ogling someone on the street. Leaning to me he said, "Custodia, Frater!" Custody, brother. Since I'd no idea what he meant, he explained: training to remove the eyes from gazing upon the vanities of the world. The mention of the pagan feast of the Lupercalia is because of the lamentable German Protestant "scholars" and their anti-Catholicism attempting to show that every Christian tradition handed down was really a pagan custom. The Blessing of Candles has found its way into the Slavonic (at least) Orthodox practice. One source indicates that the Ukrainians may have brought it into the Orthodox Church (from Rome) and thence to the other Slav churches. I remember being quite surprised at seeing the blessing of Candles in an OCA parish, but the west got the Feast from the East - at least some backwash is seen to happen as well. The Russians also took bells and their blessings from the West. Hail, Mary, full of grace, the Lord is with thee; Blessed art thou amongst women, and blessed is the fruit of thy womb, Jesus, presented by thee in the Temple. Holy Mary, Mother of God, pray for us sinners, now and at the hour of our death. Amen. By way of introduction to the Third Joyous Mystery of the Rosary, please remember the scripture: Jesus was born in to a family that owned its own business. Jesus was born in a manger not because no inn would house a poor pregnant woman, but rather because the inns were full. Church tradition tells us that Joseph was chosen by Mary's family because he was wealthy enough to care for her. He was much older than she, having at least one fully grown son already. Some traditional images of the holy family (such as the one below, by Giotto) show St Joseph with grey hair. Please get all that modern political theory about a poor homeless family out of your Christmas meditations. The second of the five Joyous Mysteries is known as the Visitation and commemorates the visit of our Blessed Lady to St Elizabeth, the mother of the Forerunner, John Baptist. The Visitation is a later-comer to the Calendar and devotional life of the Western Church, having been introduced by St Bonaventure in 1263. The Franciscans, in their devotions to the Ever-Virgin, spread the feast throughout the Church. It was extended to the entire Western Church by Pope Urban VI. The feast, with a vigil and an octave, was assigned to 2 July, the day after the octave of St. John, about the time when Mary returned to Nazareth. It did not arrive in the liturgical East until the mid-19th Century, and it is not, even now, widely celebrated. It is reported to have a service approved for use in the Church, but no amount of Googling could find the text of the service, just copies of the same report over and over. As is related in the Gospel text, when Mary said "Shalom!" the infant prophet, still in the womb of his mother, leapt for joy. Hearing of the baby's action in utero the Blessed Virgin Mary uttered her poem in praise of God, the Magnificat. In the Byzantine rite this is the Matins Gospel for nearly all the feasts of the Theotokos. The Magnificat is sung as the 9th Ode of the Canon in every Matins service (it is part of Vespers in the West) and even though in most parochial practice all the other parts of the Canon get skipped for expediency, the 9 Ode is still sung in full. Since this form is familiar to most users of the Byzantine rite, I will use it for the meditation on this mystery. When away from a prayerbook and praying this mystery, I use the embolism as below. Hail, Mary, full of grace, the Lord is with thee; Blessed art thou amongst women, and blessed is the fruit of thy womb, Jesus, bring joy even within thy womb. Holy Mary, Mother of God, pray for us sinners, now and at the hour of our death. Amen. As before, the introductory comment and the closing prayer comes from The St Ambrose Prayerbook, available from Lancelot Andrewes Press. The First decade of the Holy Rosary is in honour of the Annunciation, when the Archangel Gabriel came to Blessed Mary, the Ever-Virgin, and, greeting her, offered her the chance to become the mother of her Creator. Her acceptance of this greeting is the beginning of our salvation. 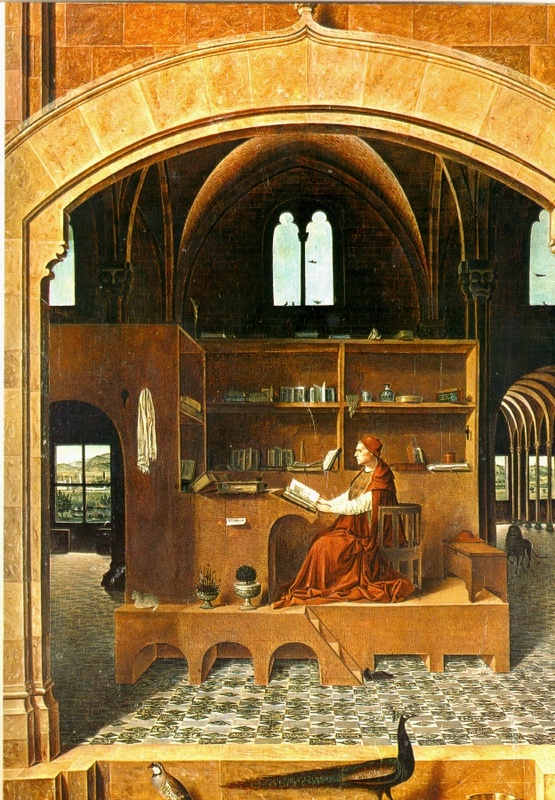 One traditional way of meditation on the mysteries is to add a verse of scripture. In these posts I will be added a liturgical verse from the Byzantine Rite, to borrow from Ghostbusters, I will be "Crossing the Streams". Hail, Mary, full of grace, the Lord is with thee; Blessed art thou amongst women, and blessed is the fruit of thy womb, Jesus, announced to thee by the Archangel Gabriel. Holy Mary, Mother of God, pray for us sinners, now and at the hour of our death. Amen. I find this method very useful when I am walking and praying the Rosary, as on my way to work. The introductory comment and the closing prayer on each post comes from The St Ambrose Prayerbook, available from Lancelot Andrewes Press. When I was exploring Orthodoxy and after I converted, there was a massive jettisoning of anything Western. Any of my friends or long-time readers of the several incarnations of this blog can confirm this. Bye bye Mr. Francis; bye bye Mass; bye bye Mass Cards, bye bye Advent and Advent Wreaths; bye bye novenas; bye bye almost all western saints (even pre-schism ones); bye bye only-blessed-but-not-Saint Augustine, etc, etc. Mea culpa, mea culpa, mea maxima culpa! The Rosary was not, however, only more jetsam. A member of the Convert Mailing List, responding to yet another "Flush-The-West" rant, pointed out that "the Little Psalter of Our Lady" was a favourite of St Seraphim of Sarov. This came to my mind recently - nearly 15 years later - when a member of our Parish visited the Serafimo-Diveesky Monastery where other things related to St Seraphim's devotion to Our Lady came up. So was planted the seed for this series of posts. The Rosary has therefore been a part of my Orthodox journey, although I've not been very faithful in recitation of it. Recently this, too, has changed, for a number of reasons that I won't go into: but let me commend the Rosary to you in this series of posts, as a portal to Paradise and a bit of it here on Earth, and as sure guard against temptation: a handrail, if you will allow the image, strung by Our Lady along the Ladder of Divine Ascent to make the assay easier for those of us who are weakest in our Spiritual Strength. These posts will not go deeply into the history of this devotion, but some may note a difference between what I will describe and a the perception, at least, of the traditional Western practice. For the Orthodox of Eastern and Western Rites, there is no practice of affective piety. Meditative "visualization" is not done. The imagination and the emotions are fallen faculties and not appropriate for devotion. It is, of course, ok to have emotions or an imagination: but these are not to be aroused as such. Such arousal is can be a vehicle for the demons to lead us deeper into human addiction to the passions and pride: confusing emotions for piety is a skill humans have honed to infinite sharpness. Since the use of mental images is spiritually dangerous, things like making mental "stage plays" of the Rosary's Fifteen Mysteries are right out. The Rosary must be used in different way - as will be seen in these posts. 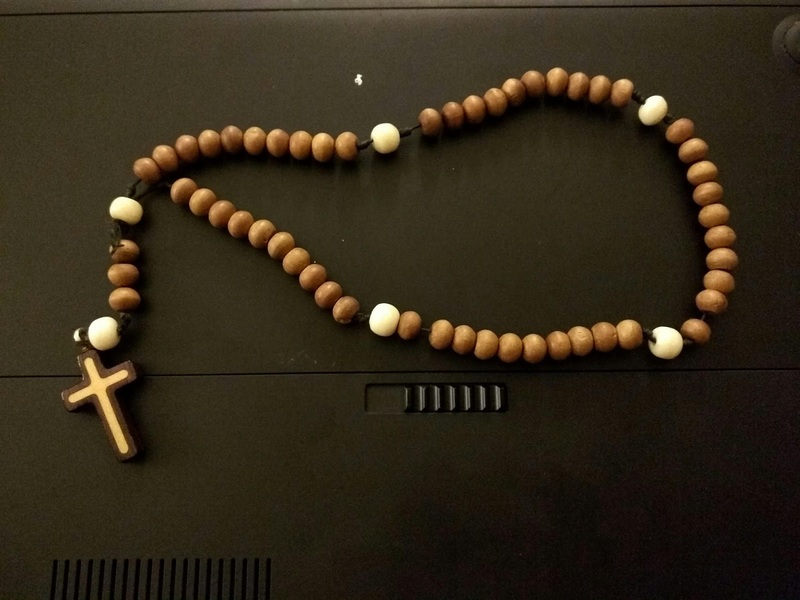 A Rosary I've made out of sandalwood and Tibetan yak bone. A circle of beads is divided into five sets of ten, with single, larger beads interspersed. From the "bottom" of the Rosary hangs a pendant of a cross, a larger bead, and three smaller ones in a single strand. Each section of ten beads is called a decade. The traditional prayer counted on the smaller beads is the Hail Mary, or the Ave from the Latin Ave Maria. The larger beads mark an Our Father. One complete decade, then, is an Our Father and ten Aves. At the end is added a "Glory be to the Father" before continuing on to the next decade. One other prayer is used, the Apostle's Creed, which is said on the Cross itself. There are some prayers used by tradition at the ending of a recitation: we'll get to those by the end of this series of posts. 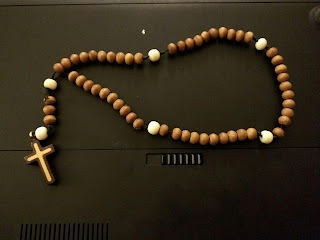 In writing about the Rosary for Orthodox we will begin with the Holy Cross and proceed, in a series of posts, through the 15 Mysteries of the Holy Rosary, dedicating one post to each Mystery. There is, in Roman Catholic tradition, one other prayer used, called the Fatima Prayer, because it is believed to have been given by Mary to the visionaries in Fatima. We will discuss this prayer in a later post, along with the five mysteries added to the Rosary by the Sainted Pope John Paul II. I will try to do two posts a week, God willing, on Sunday and Wednesday: but you see this post is coming on Thursday, so forgive me as I'm already late! I believe in God the Father Almighty, Creator of Heaven and earth; and in Jesus Christ, His only Son, our Lord, 'Who was conceived by the Holy Ghost, born of the Virgin Mary, suffered under Pontius Pilate, was crucified, died and was buried; He descended into hell; the third day He arose again from the dead; He ascended into Heaven, and sitteth at the right hand of God, the Father Almighty; From thence He shall come to judge the quick and the dead. I believe in the Holy Ghost, the Holy Catholic Church, the Communion of Saints, the forgiveness of sins, the resurrection of the body, and life everlasting. Amen. While holding the Holy Cross in your hand, make the sign of the Cross with it on yourself saying, In the name of the Father, and of the Son, and of the Holy Ghost. Amen. Then, still holding the Cross, say The Apostles' Creed. Holding the large bead nearest the Cross, said an Our Father. O my God, I believe in thee and what thou hast teach me through thy Holy Church, but I am a sinner. I believe, Lord: help my unbelief. Hail, Mary, full of grace, etc. Lord, I love thee poorly. Help me to love thee with all my heart, and with all my soul, and with all my strength, and with all my mind; Grant me to love my neighbour as thou lovest him. Hail, Mary, full of grace, etc. Then holding the chain (or string, as the case may be) say the Glory be. At this point I find it helpful, by way of reminder to the aged, to announce to myself, which Mysteries I'm about to pray and to recite them as a list. The Annunciation, the Visitation, the Nativity, the Presentation of our Lord, the Finding of Our Lord in the Temple. The Agony in Gethsemane, the Scourging at the Pillar, the Crowning with Thorns, the Carrying of the Cross, the Death and Burial of Jesus. The Resurrection of Jesus, the Ascension of Jesus, the Coming of the Holy Ghost, the Assumption of the Blessed Virgin, the Coronation of the Blessed Virgin.